The European Investment Bank and European Comission launched ELENA, a new financing scheme for supporting sustainable energy investments projects or programs. As part of the Intelligent Energy Europe program, ELENA stands for “European Local ENergy Assistance” and it is operational since September 2009. A budget of EUR 15 million euro is available for the first year of facility operation. ELENA assists cities and regions in developing their sustainable energy investment projects and mobilising investments. It covers major part of the technical assistance costs related to the preparation of eligible investment projects or programmes and focuses on retrofitting of public and private buildings, sustainable building, energy-efficient district heating and cooling networks, environmentally-friendly transport. Further information is available in the Energy section of the official website of the European Comission, as well as on the European Investment Bank Website. I had the opportunity to participate this year at the International Congress organised by World GBC on the 9th and 10th of November, just before Green Build. The atmosphere was great and I am very happy that I was able to establish more connections with GBC’s all over the world. From talking to people coming from different cultures and different continents – one might realise that we are so alike in our efforts. From Philipines to Mexico and Spain to Vietnam we are all facing more or less the same issues – how to increase the visibility of green buildings on our markets, how to get more members, how to collaborate with the public authorities etc. Therefore the topic of collaboration was one of the most present in our talks. 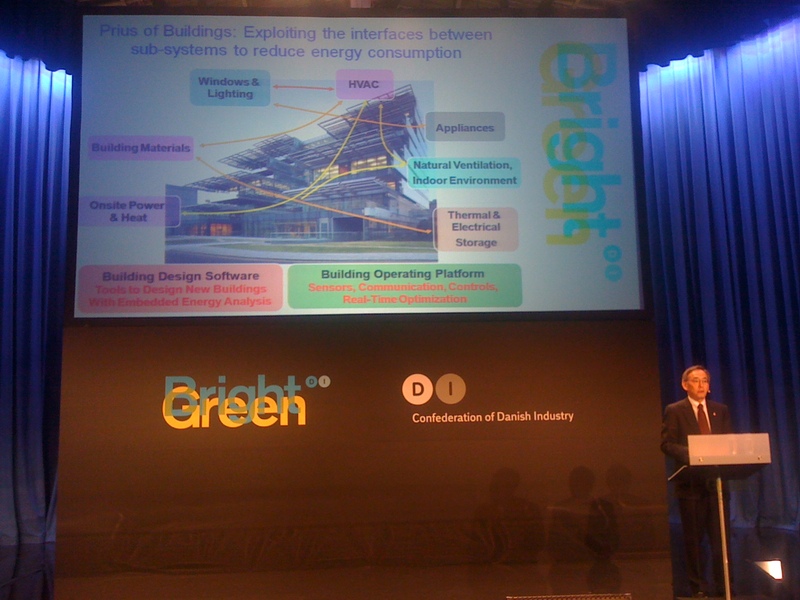 The atmosphere was great, with a lot of enthusiastic people, supporters of green building concept at the global level. 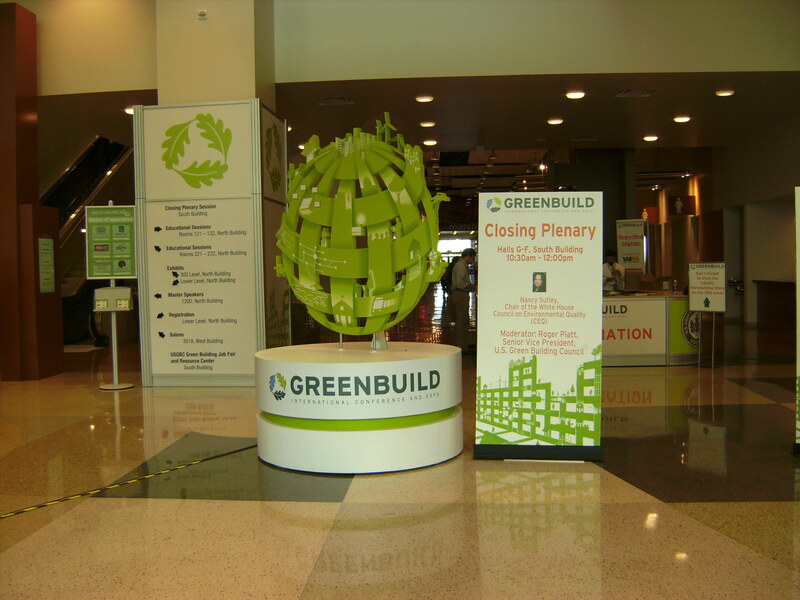 There were 34 Green Building Councils represented there out of almost 60 GBC’s in different stages of development/maturity that are now formed all over the world. Tony Arnel, the Chairman of World GBC opened the conference saying that ” Each of our efforts are focused a lot on transforming the national markets, but together we are changing the world” – quite appealing movement to be in. There were a lot of discussions on enhancing collaborations between GBC’s. World GBC created a platform with information regarding all existing GBC’s around the world – every GBC can post there not only information about their organisation, but also events , innitiatives etc. I was very impressed when GBC representatives from Mexico or Canada were congratulating us and expressed interest in attending the second edition of Sustainable Architecture in Transylvania summer school. The platform is also very useful for GBC’s to share knowledge, learn from each other and better develop colaboration innitiatives. The platform is still “in development” in terms of content – but the general public can learn even now about the latest innitiatives of the GBC’s all over the world. If you are curious to found out more don’t hesitate to go to the Green Building Councils section on World GBC and click the Councils News. Another World GBC plan to enhance collaboration between different GBC’s is to form regional networks. Right now the Asia&Pacific network is already formed and the next in plan is Europe , where RoGBC is planning to get involved as much possible. The purpose of regional networks is to encourage GBC’s to share knowledge, join forces in promoting the green building concept in their markets and also solve common problems. One of the main objectives of the European GBC network will be to lobby for green building legislation at the EU level. There were a lot of talks on the importance that buildings should have in the new international agreement that is expected to be signed in Copenhagen in December 2009. 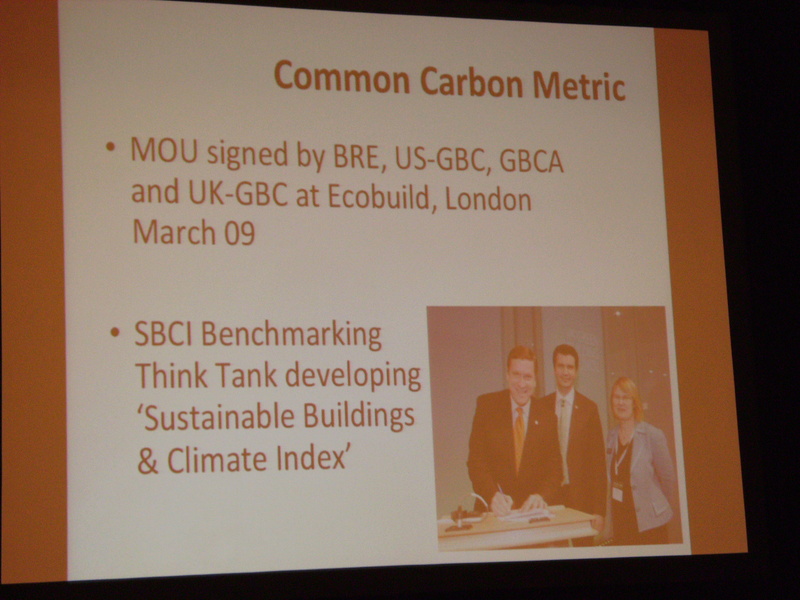 UNEP together with USGBC, Australia GBC, UK GBC, Canada GBC and SB Alliance closed a memorandum on “Common Carbon Metric Methodology” that will be used in all the main existing rating tools. If you are interested in the topic here is a document that summarizes the discussions and describes the protocol. 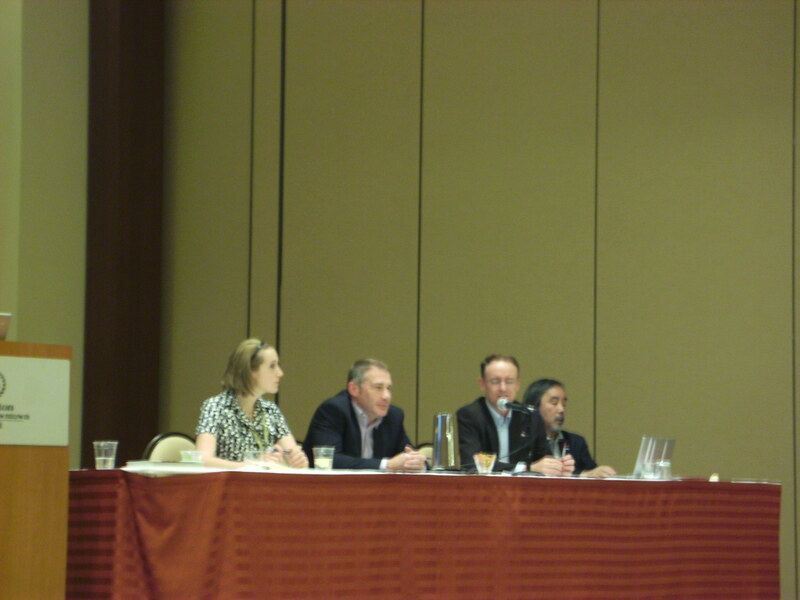 Another important topic that was approached was the Neighbourhood Rating Tools. Practically all the major rating systems are enlarging their scope with adding special methodologies for calculating / evaluating the sustainability indicators in whole communities, not only singular buildings. LEED is finalising LEED for Neighbourhoods and BREEAM has recently launched BREEAM Communities. CASBEE is also extending with CASBEE for Urban Development. Meeting the representatives of the other GBC’s is always a pleasant experience, full of energy and optimism. It gives you the feeling that you belong to a big family set to change the world for better. Next important mission of the World GBC together with the other GBC’s around the world will be to represent the cause of Green Buildings in Copenhagen this month. Can a committed family do something worthwhile for the environment? The answer is “YES”. 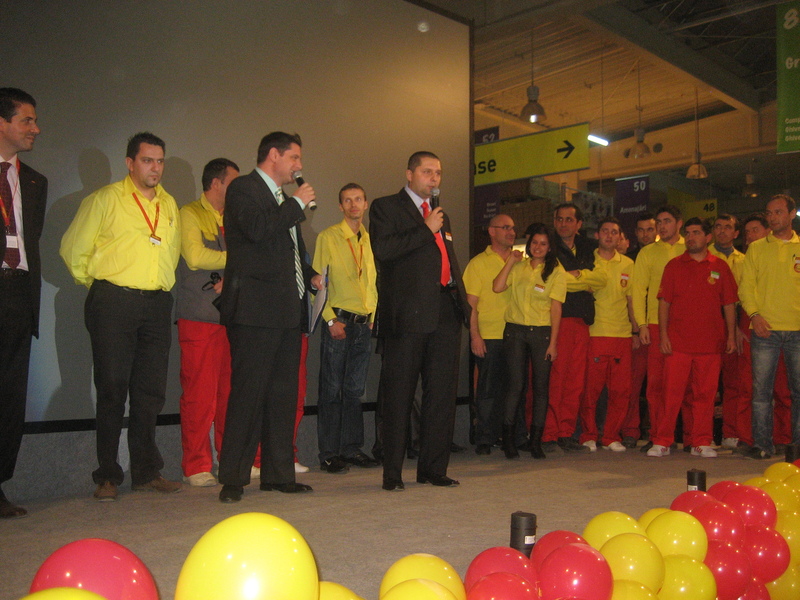 The Essl family, owner of bauMax Do-It-Yourself international store chain, proved that consideration towards the future generations is a matter of serious social involvement and that the impact of a committed family, running a responsible business, can make a statement for sustainability that would be hard to ignore. This is the visionary context in which the RoGBC member bauMax opens the first green Do-It-Yourself store in Romania. The commercial unit located in Ploiesti uses innovative green technology for heating and lighting, saving not only energy use, but also money. The store has a floor heating system, connected to heat pumps (that use earth heat and transform it into electric energy) (See appropriate correction from Francis Bradshaw below). More likely is that mains electrical energy is used to drive the heat pumps, which recover perhaps 3 times as much energy from the earth in the form of heat.. Also, the lighting system uses different lighting schemes for the different areas of the store. Plus, the store favors the use of natural light, through the glass roof insertions. To complete the ecological concept, the bauMax Ploiesti store is the host of a two-week exhibition dedicated to green building solutions and products, as well as to interactive presentations on sustainable constructions and energy efficiency, both organized in collaboration with the Romania Green Building Council. Suppliers like URSA, Lafarge, REHAU, Wienerberger, Dexion, Corporate Office Sollutions, Rigips, Calidus, Natural Paint and landscape designer Katja Perrey displayed multiple options for the Do-It-Yourself customers. In addition three specialized trainings brought quality information, delivered by Adrian Moisa (Jetrun), Sorin Pana (URSA Romania) and Andrei Lakatos (University of Architecture, Bucharest). The presentations focused on the improvements that home owners can make in order to lower their energy bills and improve the energy efficiency of their homes. Furthermore, the exhibition displayed the winning projects of a green renovation contest organized by the RoGBC and bauMax addressed to aspiring students in architecture, construction, engineering to provide visual appeal, information, and a view from future designers about the exhibition’s theme. The jury that graded the projects was formed by: Katja Perrey (KP Landscapes), arh. Andrei Lakatos (University of Architecture and Urban Planning Bucharest), Laura Nemoianu (Romania Green Building Council). The results are here. The Romania Green Building Council joined the store opening to recognize bauMax’s commitment to constructing a better building in terms of environmental responsibility and to introducing more sustainable construction products into their product selection. Click the links for pictures from the exhibition & from the opening ceremony.